Sarafino was thrilled to be invited and graciously accepted an opportunity to speak to twenty-four well educated attendees of a unique Single in the City brand networking experience held at Amicos Pizza in Toronto. The historic venue, located at 1648 Queen St W is a legendary Parkdale pizza joint which has served the city in the same location for almost seventeen years. Laura Bilotta, the Toronto Matchmaker behind Single in the City chose this spot to continue ‘pioneering’ her company’s innovative approach to planning and hosting Sponsored Experience Singles Networking events which fuse together the classic speed dating style meet & greet encounters with more refined upscale restaurant food marketing attractions to subsidize the cost of creating exceptional experiences worth sharing on social media. Singles Pizza Making Night at Amicos Pizza http://singleinthecity.ca/what-happened-at-singles-pizza-night-at-amicos-pizza/ was no exception, and it was Sarafino’s honour to help Laura Bilotta and the team at Single in the City make it a huge success. 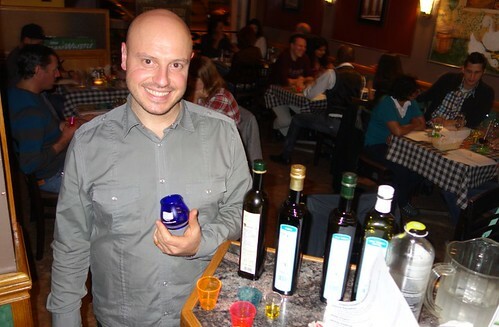 At approx 7:30 pm on Tuesday Nov 1st, 2016 our CEO Angelo Tramonti presented two dozen event attendees with an authentic olive oil tasting experience and educational talk on how to read olive oil bottle labels. Angelo’s talk was something of a bonus for people who were already hooked on the cooking aspects of the event – the opportunity to win prizes for their cooking was also a component of the attraction – and so his presentation was literally icing on the cake. These multi faceted events are one reason why the Single in the City brand singles networking attractions are so popular. As the groups went to the kitchen to cook their individual pizzas, Angelo directed the remaining patrons to cup, smell and taste the liquids in four different coloured shot glasses arrayed before them on the tables in the main dining area. 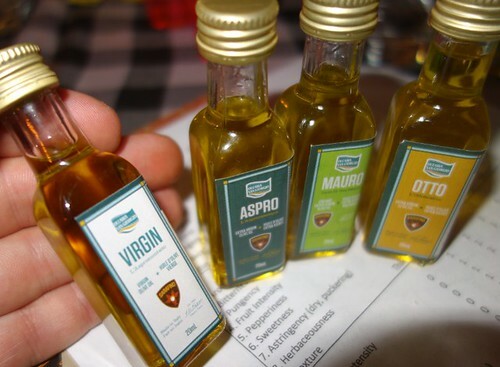 Angelo offered the group four different olive oils to try, but not before first telling these very Canadian people that they had probably never tried real, authentic, unadulterated olive oil in their entire lives. He used the inflammatory comment to spark a heated discussion about the grocery store fraud that’s happening regarding the way our legislators let importers use misleading labels so North American consumers don’t realize they’re buying diluted oils. These recent reports of widespread fraud have prompted consumers to seek true extra-virgins. Tasting is believing! The whole time Angelo was speaking out in the front of the restaurant, groups of four and five participants each were steadily shuffling back and forth, to and from the kitchen at the back of the venue. Back there, in Frank Horgan’s realm, each participant was given an apron and two minutes at the counter to add tomato paste and seasonings to a flat lump of pizza dough. While Frankie watched, these chef-de-jour’s were then allowed to garish their circular cuisine art anyway they liked. The participants often got hung up trying to decide which toppings to use – there were so many. The choices included a variety of exotic ingredients like sundried tomatoes, capers, pickled onions, asparagus, basil and other specially imported meats and cheeses, plus all the regular toppings present at the counter. Frank’s expertise was invaluable back there coaching these newbie chefs on the tastes they could impart in their selection of ingredients. Each artist also had to sign the pizza with some distinctive feature so they could recognize their work later when the pie came back piping hot with melting cheese and brown crusts. Once the pizzas came back there was a ‘feastival’ of sharing slices drizzled with extra virgin olive oil and social media powered ‘likes’. Follow @SingleintheCity on Facebook and Instagram.